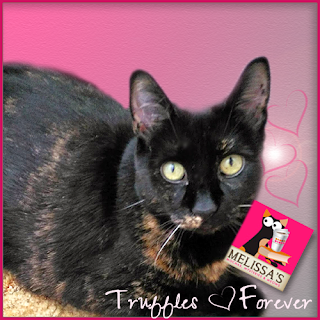 We are deeply saddened by the loss of lovely Truffles and our thoughts are with Melissa at this sad time. We were so shocked. Truffles was far too young to be dragged OTRB. We, too, were stunned and saddened to learn that Truffles had gone to the Bridge. It is so, so unfair. This has been heartbreaking for so many. Truffles will be greatly missed. We're sadder than sad. We just met Truffles when we started blogging in December and were looking forward to a long frienship.